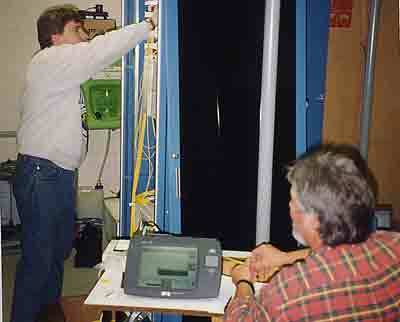 Fiber optic testing is the least well understood aspect of fiber optic installation. That's what manufacturers say and exactly what we see on FOA certification exams. Granted fiber optic testing is not simple (mostly because of the complexity of the instruments) but it is straightforward. The principles are easily learned and if applied in everyday use, they become habits for the competent installer. Testing a network using an OTDR. This lesson covers the basic fiber optic tests used to test components and installed cable plants. It includes six separate exercises that will each take some time to complete, so consider each a separate session. Begin by reviewing the lesson plan. You will follow the same procedures as with other sections: 1) watch and/or read the reference material, 2) set up your equipment for the lab and 3) do the hands-on exercises. Make certain before you begin that you have everything you need - tools, test equipment and components. Refer to the check list on Lesson 2. Follow the safety procedures learned in lesson 1. Do not use a microscope to inspect connectors until you have tested the output of the connector with a power meter as the microscope can focus all the light into your eyes. Preferably use a microscope with a IR filter to remove potentially dangerous light. Watch the videos and/or read the references and complete the exercises. Videos show processes in real time. VHO (virtual hands-on) web pages are step-by-step instructions on how to complete the hands-on projects. Both should be used to learn and do each of the processes. Watch the videos and/or read the references above and perform the exercises. If you are using the FOA CFOT Certification Laboratory Manual, go to Fiber Optic Testing, p49, which gives step by step directions. 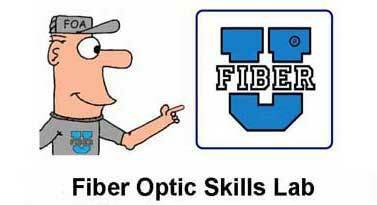 Download the Fiber Optic Testing Worksheet and Fiber Optic Loss Budget Worksheet and answer the questions as you complete each exercise. Warning: VFLs can be powerful enough to be an eye hazard. Do not look directly into the VFL connector or the end of a fiber illuminated by a VFL. 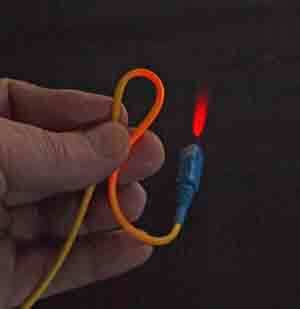 Instead, aim the end of the fiber at a light colored object and look for the laser light. Connect a cable to the VFL or visual tracer, and check continuity by seeing if the fiber transmits light. Compare the amount of light transmitted through SM and MM fiber. While the cable is connected to the VFL, put bends in the fiber as shown above (yellow jacket SM fiber shown) and note the loss in the cable. Can you tell a difference in the output of the fiber at the connector? Why? If you have a cable (preferably yellow jacket SM fiber) you are willing to damage, break the fiber and see what the cable looks like. Inspect the connectors on the patchcords or cables with the microscope immediately upon removal of the dust caps. What do you see? Clean the connectors and inspect again. Is the ferrule surface clean? If not clean again. Use both wet and dry methods. Replace the dust cap, remove it and check the connector again. Was it still clean? Touch the end of the connector with your finger and inspect it. Clean and inspect again. Drop a connector on a carpet (perhaps the one on the cable you broke for the VFL exercise) and inspect it. Clean and inspect again. Turn on the source and let the output stabilize. Turn on the meter and familiarize yourself with the controls. Put the meter on dBm and set the wavelength to the wavelength of your source. Measure the power output of the light source. Stress the cable by putting bends in it (as with the VFL exercise) and note the differences. Change the wavelength setting to another wavelength and note the changes. Why does the measured power change? Measure the output of a 850nm or 1300nm LED source with both SM and MM fiber? What changes do you note? Before measuring loss, it is important to calculate a loss budget so you have an idea of what the loss should be if the components are in good condition. A: Calculate the loss budget for a long distance network: singlemode fiber, 75km long, 14 splices, LC connectors on each end. Fiber attenuation at 1550nm is 0.21 dB/km, splices average 0.05dB and connector losses are 0.3dB/km. B: Calculate the loss budget for a metropolitan network: singlemode fiber, 6.5km long, 2 splices, one intermediate patch panel plus LC connectors on each end. Fiber attenuation at 1310nm is 0.40 dB/km, splices average 0.05dB and connector losses are 0.3dB/km. C: Calculate the loss budget for a LAN backbone: OM3 fiber 210meters long, no splices, two intermediate patch panels plus SC connectors on each end. Fiber attenuation at 850nm is 3.10 dB/km and connector losses are 0.5dB/km. How to calculate loss budgets easily: FOA has a free loss budget calculator for iPhones and iPads. Calculate loss budgets for a cable plant you can make from the cables you have for the exercises. Remember you need two patchcords for reference test cables. If you are not familiar with the operation of these instruments read the manuals and work with the instrument until you know how to change test parameters and interpret the display. Attach one cable to the source which will be the reference "launch cable" and measure the output with the power meter. Set the power meter on the 'dB" range and push the button to zero the reading, setting the "0dB" reference. Using a mating adapter, attach a second cable (the cable to test) to the launch cable and measure the loss. What are your measuring? Reverse the cable to test and measure again. Is the loss different? Why? Test other cables and record the results. Modify the launch conditions with a mandrel wrap on the launch cable. 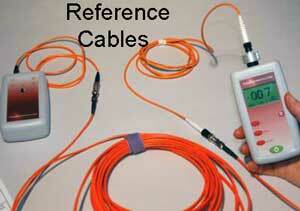 Make a measurement of a cable under test and record the results. Wrap 5 turns of the cable around a 25mm (1 inch) mandrel (any round object will work) and repeat the test (set 0dB reference, check connection to receive cable, insert cable to test and record data.) Are the results different? Why? Repeat the test with a cable plant made from several cables and note the results. Use a 62.5/125 micron cable for a launch cable and test a 50/125 cable. What is the result? Use a mandrel wrap on the launch cable and repeat the test. What is the result? Use the same 62.5/125 micron cable launch cable to test a WM cable. What is the result? Use a 50/125 micron cable for a launch cable and test a 62.5/125 cable. What is the result? Patchcords and cables, both SM and MM, at least three of the same type for testing (2 reference test cables and one cable to test) and mating adapters. The cable to test for the exercises should be long enough to also be used in the OTDR test exercise as you will compare the test data for each method. Using a mating adapter, attach a second cable (the cable that will become the receive cable) to the launch cable and measure the loss. What are your measuring? DO NOT RESET the "0dB" reference. Detach the two cables and insert a cable to test using another mating adapter and measure the loss. What are your measuring? Change the reference method to a "two cable reference," i.e. set the zero dB reference with both a launch and receive cable and repeat the test on the same cable you just tested. Record the results. What is different and why? Change the reference method to a "three cable reference," i.e. set the zero dB reference with both a launch and receive cable and a third reference cable between them and repeat the test on the same cable you just tested. Record the results. What is different and why? Compare your tests of the same cable with one, two and three cable reference methods. Use a 62.5/125 micron cable for the launch and receive cable and test a 50/125 cable. What is the result? Why? 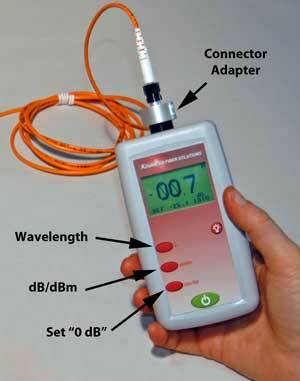 OTDR with adequately long launch and receive reference test cables, preferably of the same fiber and equal lengths. If you are not familiar with the operation of this OTDR read the manual and work with the instrument until you know how to set parameters manually, take traces and analyze them using both "two-point" and "LSA" methods. Connect a launch cable to the OTDR and set the OTDR in the manual mode. Choose a range appropriate for the launch cable, typically the shortest range for the OTDR. Set the pulse width to the shortest option and averaging to a short time period or ~32-64 cycles. Set the wavelength to 850nm for MM or 1310nm for SM. Take a trace of the launch cable. Measure how long it takes for the trace to return to the baseline (the "dead zone"). Change the pulse width to longer options and measure the changes to the length of the dead zone. Attach a cable to test to the launch cable and reset the OTDR to the shortest pulse. Take a trace. 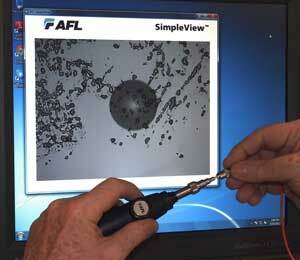 Can you see the end of the fiber in the cable under test or is it too noisy? If it is too noisy, go to a longer OTDR pulse or average for a longer time until you an clearly see the end of the cable under test. Using the two marker method, measure the loss of the connection between the launch cable and the cable under test and the attenuation of the fiber in the cable under test. Record the results (including saving the traces for later comparison.) Repeat the tests using the LSA methods. Record the results and compare to the two marker method. Are there differences? Why? 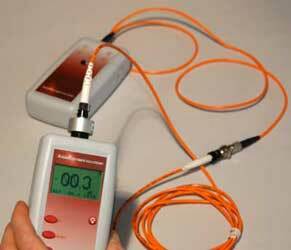 Measure the reflectance of the connection between the launch cable and cable under test. Can you measure the loss of the connector on the far end of the cable under test? If not, why not? 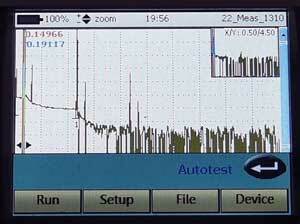 Change the OTDR to the "autotest" mode and repeat the measurement. Compare the results. What is different? Do you see any "ghosts" in the traces? Attach a receive cable to the far end of the cable under test. Now using the two marker method, measure the loss of the connections on either end, the attenuation of the fiber in the cable under test and the total loss of the cable under test including the connections on each end. Record this data for comparison. Repeat the tests using the LSA methods. Record the results and compare to the two marker method. Are there differences? Why? Reverse the cables (remove the launch cable from the OTDR and connect the OTDR to the open end of the receive cable without disturbing the other connections) and repeat the tests. Record the results and compare to the two marker method. Are there differences? Why? Change the OTDR to the "autotest" mode and repeat the measurement. Compare the results. What is different? Record the traces at one wavelength and test at the other (e.g if you have MM traces at 850nm, take a new trace at 1300nm, or SM at 1310nm, change to 1550nm.) Compare the traces. 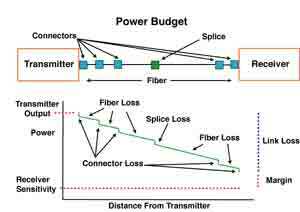 Is the fiber attenuation different? How about connections? Install the OTDR simulator on your PC. Open the program (ignore the warning that it is looking for the hardware of the PC OTDR it was written for.) Follow the manual to understand how the OTDR Simulator works. Go to the folder "Parameter Traces" and open the traces w-850.sor and w-1300.sor and compare them. Each set of files with the same beginning to the name are meant to be compared. Do that with each set to see what happens when you change parameters on the setup menu of the OTDR. The folders Traces and Span Traces include more traces to analyze. C: Calculate the loss budget for a LAN backbone: OM3 fiber 210meters long, no splices, two intermediate patch panels plus SC connectors on each end. Fiber attenuation at 850nm is 3.10 dB/km and connector losses are 0.50dB/km.